Dry skin around your eyes not only feels uncomfortable, it’s also especially noticeable. 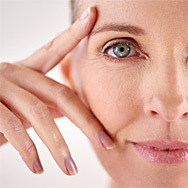 Wrinkles and dark circles become more prominent, crepey skin texture is exaggerated. Dry skin around the eyes can happen no matter your age or skin type, so let’s explore why this happens and, more important, what you can do about it! The primary reason the eye area can be dry is that it has very few active oil glands, so it doesn’t have any natural ability to keep skin moist and glowing. Using drying cleansers or drying makeup removers over the eye area depletes what little moisture you have around the eye area, causing extreme dryness, especially if you’re using these kinds of products daily. Using skincare products with sensitizing ingredients, especially fragrance (synthetic or natural) will aggravate skin on the face, but especially the skin around the eye area. Makeup products that are difficult to take off and require a lot of effort to remove can be hard on the delicate skin of the eye area, causing dryness and redness. Sun damage is another major reason skin around the eyes can become dry, look more wrinkled, and make dark circles appear more obvious. Some medical conditions can be a source of eye-area dryness. If you notice that the dryness around your eyes is chronic and recurring, it could be the result of an underlying health issue, so consulting your physician would be best. The first and most important step in taking care of dry skin around your eyes is to use gentle, soothing skincare products, especially cleansers and makeup removers. For a targeted approach to the skin around the eyes, you may also consider Paula’s Choice Skincare’s RESIST Anti-Aging Eye Cream, a rich, emollient balm that’s excellent for nighttime use. For daytime, our RESIST Anti-Aging Eye Gel is ideal due to its smoothing, lightweight texture and ability to work well under sunscreen and makeup. Don’t forget to use sunscreen each morning! This is a critically important step to protecting the delicate eye area. Some people have sensitivities to synthetic sunscreen active ingredients, so choosing a gentle, mineral-based sunscreen is best. Paula’s Choice Skincare offers several mineral-only sunscreens ideal for use around the eyes.